12 weeks in which to prepare a business plan and present it to a panel for approval. I suppose it might be easy if you have previously been down this road. BUT, none of us have, so its a steep learning curve - maybe a vertical one. Today, I started a business studies course at University. I am now a student again. I get a student union card. After browsing around the google site I discovered this area. Every logo that has appeared since Google was launched. There are some great ones in there - I love the Monet and Mondrian ones, and the Dilbert doodle logo just had me rolling around. 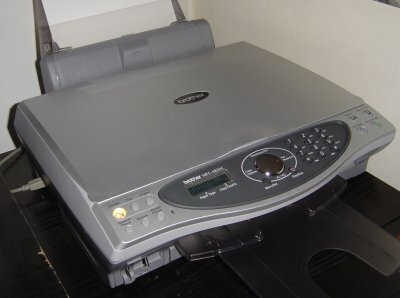 I've invested in an all in one printer - scanner - copier and fax machine. Its looks good, and it works with the computer. I just don't know what half of the buttons are for. I need to go and read the manual and find out. Every so often you receive unexpected post that makes you smile. Take today. The postman delivered the usual mail - bank statement, gas bill, credit card statement, electricity bill, etc, etc, and then the dreaded letter from the Inland Revenue! With a audible gulp I began to open it and read the first sentence. Three words stood out instantly and made me re-read the sentence. So after rubbing my eyes and pinching my arm I read it again. Yep, it's still there - a cheque FROM the Inland Revenue. I haven't written a thing here for a few days. There is a reason for this. I have been very busy, using the computer to email and write to many people. I noticed today the PM was talking at the TUC conference and spouting about how employers need to value for their employees to make them feel valued and, as a result, work better. Nice idea Tony, how about a word with your education officials then. I don't think they got the memo about making the teachers and TA's around the country feel valued. I think that one of the reasons was the reduction of one of the main routes into the city being reduced from 2 lanes and a bus lane, to a single shared lane while some resurfacing took place. Maybe I'm being to logical here, and I'd never make a councillor for having thoughts like this, but surely it would have made more sense to resurface the road and reduce the lanes AFTER the rush hour when the roads were quieter. Wouldn't it??? Well, both machines in the study now have XP SP2 installed, and apart from a blue bar rolling across the screen, instead of green, at startup and a new security centre and wireless network function, there seems to be no difference. Following a weekend of no web access due to home network issues, the connection was back today, and so I took the opportunity to download and install Service Pack 2 on the two machines in my study. After spending an age making a backup of all the important data on my main machine I finally pressed the update button with a trembling finger. Everything went smoothly and it's working fine. My thoughts are with the Russian people. I finally got around to reading the weekend paper today, and what a pleasant suprise to discover that back in the 1990's Whitehall was just as annoyed and fed up with the then Chief Inspector of Schools, Chris Woodhead, as the teachers of the country were as well. Isn't it nice to know that the powers that be agreed with you!